when I travel to other cities, the first thing that I look for is, what are the best places to eat in that city. And that, I guess, is pretty normal. And so, as a very standard query, I get the same question back- “what is the best food in Kolkata? or what are the famous food joints in Kolkata?” Now as they say, “the answer my friend, is blowing in the wind” …. Being a food enthusiast in Kolkata, even that’s not easy for me to list out. So, I thought this time, why not have a listing for Kolkata food? No specific genre, no cuisine specific- but just best Kolkata food. And here it goes. Please understand, there are lots of other good biryani joints in Kolkata, but I find only the above mentioned discussable. So, as the Kolkata Kathi roll and biryani sections are taken over, let us talk about the item, for which Kolkata is famous world famous. And no brownie points for guessing that it is the sweets. Kolkata sweets can be broadly clissified into few genres, like Sandesh , Rasogolla, Doi and fusion sweets. Yes, it’s varied, it’s distinct and I do have my own favorite list. so, please check the list in our web series called Foodka here. But if sweets are discussed, can we really ignore the marwari sweets or rather the vegetarian street food options in burrabazar ? somehow, food in Burrabazar, Kolkata had always remained an enigma to me. Burrabazar is the trading hub of Kolkata and is flocked by thousands of Gujrati and Marwari traders and businessmen, among others. So, the food in Burrabazar is predominantly vegetarian fare (barring probably Royal India Hotel and Zakaria Street/ Colootola area) and more inclined towards some delicious gujrati and marwari specialty. Recently I did one food walk in that part with Good Vegetarian Food group and below is my finding for it. Please check and let me know your preference. Momo is an item, which has gained immense popularity in last few years. Momo means peach – in Japanese language. MoMos are conventionally of 3 types. Steamed, fried and pan fried. Traditionally, momos used to have 3 kinds of feeling- minced meat, minced potato and khowa. Later, cheese mokka came into play. Momos with one side braised on tawa is called Kothay. In the 17th century, Momos came down from Tibetan highland, Lhasa to kathmandu by newari traders. And then were popularized like anything. Newari traders travelled between Lhasa and kathmandu via the Himalayan valley and it took 10-12 weeks. The newari traders settled in darjeeling, kalimpong, Gangtok , dharamshala and many other places. It might be interesting to know, that the first roadside momo stall, Tuladhar recalls, was seen in Kathmandu around 1942. But if we talk of Kolkata, can we really go forward not talking about Bengali food? Being a bengali পেটুক, born in Kolkata, I have a certain mental blockage against eating Bengali food at a restaurant. I always calculate mentally which fish costs what at the fish market and what price I am paying for it at the eatery. Solely, due to this reason, I prefer a Pice Hotel than a posh “authentic Bengali restaurant” any day. And, here, I would love to mention a few of my favorites in the city. Now, why its called a pice hotel? As far as my knowledge goes, this concept started a few decades back, in the era where things were available in paisa and then a full meal here (the basic ones) were available at the cost of a few paisa. Hence, people used to call them paisa hotel- pais hotel- pice hotel. By now you must have started cursing me on why I have not included chinese food in the list … yes, for last 150 + years, that has actually become a way of life here. 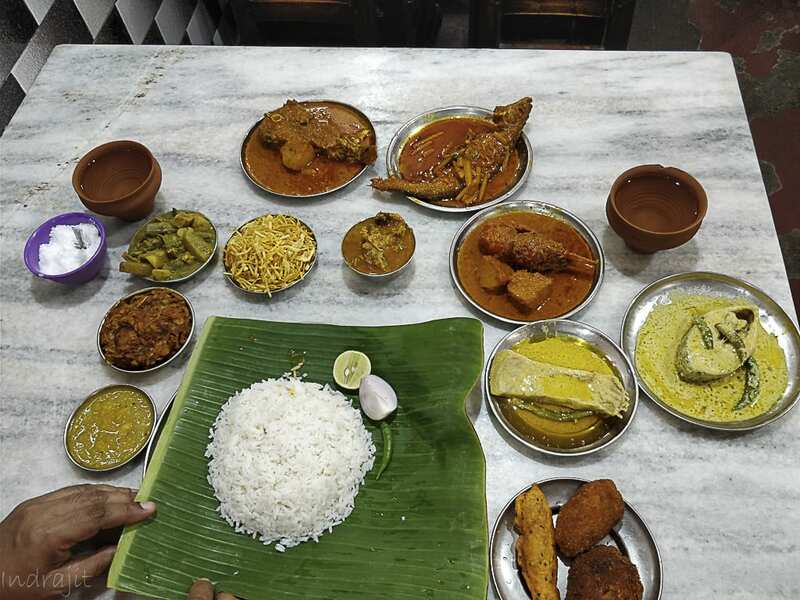 When one broke Chinese businessman named Tom Achew had landed in what we called today as Achhipur, little did anybody know that probably the most loved cuisine in Kolkata was borne. Over the time, Chinese cuisine has gained such popularity among the local crowd, that it is almost impossible to beat it. The primary influence here has been of the Cantonese part of China food and we’ve customized them here as per our local palate. This is the story of one old school Chinese restaurant. Now, I am a bit confused in this genre and sadly, I don’t have any compiled list of my favorites. But does it mean that I have none? Hell no. So, here are my favorites. But, I had compiled my favorites for Outlook Traveller once and you can check it here. But oops, did we just forget the Best Phuchka in Kolkata ? If we talk about Kolkata food, can we really ignore the cabins? I doubt. they’ve been there for last so many decades and have seen so many issues of love, friendship, despair. There have been multiple famous cabins in Kolkata and strangely, North Kolkata rules in that area. In South Kolkata, Cafe at Hazra More rules (you can read about it here) and we can design a not-so-small food walk around the North Kolkata lanes. Kolkata has got a rich influence of European and Anglo Indian cuisine. But my personal favorite is one of the oldest Jewish bakeries in town called Saldanha bakery. Now, there goes around a story in Kolkata gastronomic circuit that the best traditional anglo-Indian cakes are found not in fancy hotels, but in few homes, and over the period of time, they’ve become legends. Many have heard of the name, but few have actually been there, here’s the story. And if you’re looking for a complete compilation, do check it at Foodka winter special episode here. This is becoming a long long list. And for a culturally complex and cosmopolitan city like Kolkata, probably it’s pretty obvious. But can we really ignore the typical foreign food joints here? Especially the cult favorites like Italian or the unusual one like Russian or Parsi? Let us be honest. Pizza is a weakness– for me and my son at least. My wife stays silent in this regard, but with the enthusiasm, she attacks her slice, probably is its same even for her. Now, as the experts say, getting a good authentic pizza is pretty difficult in Kolkata. But, as I’ve never been to Italy, so I can’t vouch for any outlet serving authentic pizza. But what I can do, is to talk about one joint which is serving the best pizza in town, as per me. For a middle-aged bong like me, Russia means primarily the Russian folktale books. When I was a kid, they used to come pretty cheaply, like some 10/- a piece and I still remember myself returning from the book fair with few packets full of them. But, times change and in my youth, another Russian thing, where I found interest, is the Russian TV channel TV-6 or TB-6. Let me be honest, it used to broadcast Tom-And-Jerry-show-For-Adults in midnight- literally. But, it took me long enough to understand that there can be another interesting segment called Russian Food and that’s not boring either. And here is probably the only Russian food joint in town. Of all the Indian cuisines, parsi cuisine is one of the most underrated one. As per the history and Quissa-E-Sajangoes (and as usual, I’m extremely bad with both), parsi community came down to India during around 8th century and settled in the western coast. The cuisine is, for some reason unknown, very closely guarded and kept secret only to the community. As I could find out from my Mumbai stay experience, the food is prepared using the “Khatto-Meetho” philosophy– which means a little of sweet and little sour in taste. And in reality, the dishes are neither too spicy, nor too sweet (barring off course, the desserts). Fish and meat are heavily used along with the staple dose of rice and Pao. Probably, this is due to the fact that the Parsi population in India is slowly diminishing. But can we understand a city by only visiting restaurants? I guess not. There are gems hidden in the nooks and corners of Kolkata for best Kolkata Street food. One needs to walk along the streets to find the hidden gems and wonders. And if you are really interested, please check my blog section for Food walk here. And finally, let me introduce you to the blue-eyed boy of Kolkata food-walk. This place is at the central Kolkata (Goolge location) and at the hub of office para. But apart from some great street-food and the legendary shop of Chitto Da and Suruchee, it has got an interesting history. Around 200 years back, Philip miner Dacres used to meet sailors over great meals, hence the name. Later on, it was changed to James Augustus Hicky, the Irishman who launched the first printed newspaper in Asia- hickey’s Bengal gadget. This year, honorary US Consulate asked us, team Foodka, to take US chef Kelly Cox on a food-walk there. And here is the experience. So, here we are finally, with my choice of the best Kolkata food. But I can assure you that this list will be updated- times and again. Meanwhile, do let us know in the comment on that would you like to include or what you’re looking at – for Best Kolkata food … This blog post will be updated soon. So, do stay tuned with Mohamushkil.